If you are anything like me you have dreamed about building your own timber frame home for years. Dreaming about it is the easy part. Planning it IS work. Fortunately the more research and planning you do ahead of time the easier it will be for you in the long run. The only regret I have about my now completed timber frame home is that we didn’t build it sooner. I have gathered some pertinent questions it will be necessary to ask & answer before you can realistically start your planning process. Do I know where I want to build my timber frame home? What is your land BUDGET _______________? Be realistic. What qualities does the property have that may affect your choice of a timber frame plan? How does the land lie? Are there features you wish to emphasize such as a stream ,lake site, waterfalls, distant views, a place for a sunny garden, unusual plants, specimen trees, boulder or rock formations, etc.? What if any views do you have that you want to make use of? This question is not always as easy to answer as you might think. When planning our timber frame home we had only assessed the property in the spring and summer; when fall came we had a view of the mountains I could not pass up. So if possible you should consider your property seasonally. The leaves are not always on the trees. This should also be taken into consideration when assessing how much natural light a room will receive. How much does Mother Nature love you? Will your home be subject to heavy snow loads? How much rain will you get? Will you have to have an erosion plan? Will extra money have to be spent dealing with the run off? Let deciduous trees shade your home in summer, decreasing heat gain in summer. They will allow sunlight in to warm the house in winter. A two foot overhang will help protect the sides of your timber frame home and decrease heat gain in summer, and it will let sunlight in from a lower winter sun in the cold months. How will you get electricity to your building site? Is there electric service nearby that you will able use? Are you miles away from the nearest power pole? Are you going to have to pay to run power to your site? Are you going to go solar or have your own generator? Will the property pass a perc test? A perc test indicates the soils ability to absorb liquid over a specified period of time. How long it takes the soil to absorb liquids will be a deciding factor in how large and what type septic system you will be required to have. If it does not pass a perc test you may not be permitted to build on the land. Is there a hook up to local sewer system available? Is there a source of potable water? Is there a hook up to the local water system available? In rural areas, obtaining potable water usually means drilling a well. You may want to find out how deep and how much well costs usually run in your area. How will your building site be accessed? Does it already have a driveway with plenty of parking for construction? With a timber frame you will need at least room for a crane and an area from which to stage the timber frame materials? Is the area ABOVE where the crane will be working free of overhanging branches, power lines, etc.? I have yet to meet a crane operator that trims trees for free. How far away from a fire department is the property? This question is posed for you to consider the after construction insurance costs more than any thing else. Does any one in the household have need to be near to a hospital, dialysis center, etc? Do you know what style timber frame home you want? Post and beam, mortise and tenon, post and plate, are to be considered. Not all cost the same thing to construct, nor does it cost the same thing to erect a unique post and plate house as it does a bent type home. Our timber frame office complex is post and plate timber frame construction of eastern white pine. Our model home’s great room is a fine example of compound joinery and is cut of eastern white pine. The remainder of our timber frame model home is mortise and tenon bent type construction and is cut of hemlock from Maine. Our timber frame structures are joined by oak or locust pegs unless a structural engineer specifically calls for metal to be employed in the joining of materials. Do you know what species of wood you want? The majority of our timber frames are cut of eastern white pine. Eastern White Pine is readily available in our area, and we believe it is more stable than other woods (i.e. it splits, warps, and twists less than other varieties). We have cut timber frames of Douglas fir, cypress, white oak, southern yellow pine, and hemlock. We generally use green timbers which have higher water content and are more easily sculpted. We can, however, have the timbers dried prior to cutting. This does add considerable expense and does not prevent the natural cracking or checking of the wood as it dries. It should be noted that the natural cracking or checking of the wood as it dries does not affect the structural integrity of the timber frame structure. Timbers actually become stronger as they dry. Eastern White Pine is readily available locally. It varies in color from white to cream when it is freshly cut, turning to a golden honey color in a few years. It checks less and is more stable than most other woods. Hemlock which we obtain from Maine and Massachusetts is also white to light cream in color when it is freshly cut turns to a light coffee with cream color after a few years. Hemlock is said to have insect repellant qualities. Hemlock checks and twists more than Eastern white pine as it dries. It is our standard to use cherry or walnut splines to strengthen the some of the joints in our timber frames. We have at the customers request used splines of oak and southern yellow pine. What are your timber frame design needs? You have to decide what your families needs are, present and future. You want a floor plan that your family will be able to enjoy and support your activities throughout the years and still remain functional. Designing by Wrote. Writing things down is an excellent organizational tool. If you are a couple we suggest you start with two separate lists and then merge them into one. Whether you design the house your self or turn it over to an architect or designer you will need to fill out the lists. Really, they work. The first list should be that or what is required by code, covenant or development in order to get your building approved. I am going to title this list GOT TO HAVE IT LIST. I will give you some examples of what should be on the ‘Got to Have it List’. Each persons ‘Got to have it list’ will be unique to them and their own timber frame. The minimum or maximum sq footage your development allows should go here. Code issues such as septic systems, set backs, maximum height of the building, earth disturbance guidelines, how far back your timber frame has to be from the creek or stream, etc, should be on the list. The restoration project of the old dairy farm and the building of a green home. The site is 4 plus acres, partially wooded, with a 2′ wide creek running through. It was partially open meadow. Part of an old dairy farm, there were invasive species of plants (privet hedge, multiflora rose, honeysuckle) and pest plants (poison oak, blackberries) which were so thick rabbits had trouble navigating. We used some onsite wood ( knee braces, flooring, and trim of walnut and pear), all new framing timbers (they were required by NC law to be graded for structural integrity) and stone from the field, creek, and local roadwork for drystack retaining walls. Construction materials were used several times during building, such as 2×4 bracing for the timber frame during the raising, later used for toe boards, and then as part of interior walls. Energy efficiency The 2800 sq. ft. timber frame house is powered by our local power grid. Passive solar gain comes from windows on east and south sides. Active solar heat for hot water and photovoltaic panels were feasible, but we elected not to use them at the time. Heating and cooling is from a heat pump with a propane backup furnace, which has never come on. There are no water conservation measures. Gutter outflow is carried underground to the protected banks of a creek 40 feet away. And there are French drains along two sides of the building which drain springs. Our well produces 65 gallons per minute, and has so far, even before Huricane Fay and our current drought, never stopped giving us adequate water. We still are careful with water usage, and any irrigation for plants comes from the creek. Costs of heating and cooling and powering the house averages $75 per month, year around. Insulation is structural insulated panels, or SIPS. Summer shade is provided by large sycamore and walnut trees to the east, south and west. We expect the building to last at least 300 years, as many similar timber frame buildings in Europe and New England have done without the advantages of modern roofing, flashings, and foundations. The roof is painted steel, and exterior is painted cedar shiplap siding. The SIPS insulation should far outlast cellulose and fiberglass at least in efficiency, as the SIPS do not settle. Air quality. We use no carpet. We have wooden floors and wool area rugs, and wainscotting of local timber rescued from sawmill firewood piles. The timber frame is local white pine for the living room and hemlock recycled from the adelgid infestation of New England hemlock forests for the remainder of the house. Finishes were Watco and water based polyurethane. Flooring is wood-walnut, spalted sycamore, spalted maple, heart pine. Low VOC paint was used on our sheetrock. Dehumidification is done by our heat pump. There is no need for air to air heat exchangers, and we have no air quality problems. Between Florida and Michigan, I believe there is no need for these machines. Our house is beautiful, inside and out. It fits into its rural setting, and nestles along the creek and patio, mostly hidden from the road by large sycamores, Eastern red junipers, and poplars. Each time I enter the house, quiet and contentment wash over me and I am happy to sit quietly and enjoy the always intriguing structure of the timber frame. We plan to live here as long as we can. 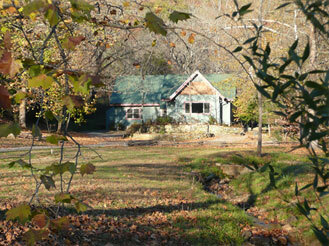 The house is almost hidden in summer, with views of the Appalachian Trail ridges in the winter. We have planted many native trees, shrubs, and plants along the creek and road for privacy and for restoration of the native flora. The old dairy farm fields are much cleaner, we have removed most of the honeysuckle, privet hedge, multiflora rose and poison oak, and we still have visits from wild turkey flocks and herds of deer. We have seen as many as 14 of both species. Our house was built before HERS was available. We recently had it blower tested and evaluated by an accredited professional. It was compared with the imaginary all electic reference house and was projected to use 86% of the energy of the reference house. When ACTUAL costs of heating, cooling and powering the house were compared with the reference house, our costs were 59% of the reference house. We are unable to get it certified because it was not inspected during building. However the bottom line speaks for itself. First, let me attempt to define green. Almost every imaginable slice of the building industry has claimed to be green even if it means only the use of wood or bamboo flooring or “organic” cellulose for insulation. Lets take a step back to look at buildings which have been successful for centuries (ie., lived in, useful, and enjoyed). Many timber frame buildings, residential and otherwise, have been in use for centuries in Europe, Japan, and North America. Indeed, most structures built were timber frame until the advent of cheap nails and water or steam power to mass produce small dimension lumber, about 1845. Since then, the quality of framing construction, in general, has deteriorated. Consider the need to hold the corners together with plywood in many current frames. Timber frame buildings last remarkably well. They are inherently strong, and wooden pegs do not rust. Part of this tendency to last well is the framer’s skill and desire to create a showpiece for centuries, and the homeowner’s pride in the ownership of such a building. With today’s improved roofing, flashing, and other materials, modern timber frames are likely to outlast their forebears which have lasted centuries. Flexibility is another important quality. There are no load bearing walls in a timber frame, so walls may be moved or removed as the need arises, easily, with no concern of weakening the structure of the building. Even if the building is razed, the timbers may easily be recycled. Efficiency is of paramount importance with energy costs high and rising. The current best insulation, structural insulated panels or SIPS, was first used by the refrigeration industry for walk-in refrigeration units. Now these extremely efficient panels are used on the walls and roofs of timber frames to produce very strong and durable insulating envelopes around the building. This results in remarkably decreased costs of heating and cooling. Often, to encourage efficient building, there are tax credits on the local, state, and federal levels as well as local electric company discounts for buildings qualifying for the LEED or Healthy Built Homes programs. Your accountant can provide advice on this. Please click on the links below for more information. Buildings use 37% of the total energy consumed each year in the US. Most old ones and many new ones are quite inefficient. Green building means quality building. More specifically, it means achieving durability, efficiency, and sustainability. A building does not become green by using local wood, VOC free paint, or an Energy Star refrigerator. These are unequivocally good, but there is much more to being green. A large part, perhaps the greater part, of being green is achieving efficiency in conservation of energy, or maintaining a low cost of heating, cooling, and powering a building over a period of years. This is mainly accomplished by using very efficient insulation: structural insulated panels, or SIPS. For a decade now, our company, Cabin Creek Timber Frames, has been building green residences and commercial buildings. Recently, rating systems have become popular, such as the LEED and HERS (home energy rating system) which projects the efficiency (the cost of powering, heating and cooling) of a building based on the plans alone. There is no provision in HERS for rating buildings built before 2005 when the system came into use, even though some very efficient buildings were already being built. Residence: Recently, when one of our houses (SIPS/timber frame), built before the HERS requirements were in place, was compared with the imaginary all electric reference house using the HERS system, our actual house was projected to use 86% of the energy of the reference house. When our actual costs of heating, cooling, and powering were compared with the ideal reference house, ours required 59% of the projected reference house energy use. Commercial building: Our office (SIPS/timber frame) and beamery (metal building) complex, 9256 square feet, was recently evaluated by a professional engineer who compared a reference electric office/manufacturing complex with ours, looking particularly at the efficient use of power. With our use of waste wood (carbon neutral) in our detached furnace to heat the entire complex with radiant floor heating, our costs were 43% of the predicted electric building group, producing a savings of $9000 per year. Timber frame buildings with SIPS panels are inherently efficient. They commonly cost one half as much to heat and cool as equally R-rated fiberglass/stud wall structures. The use of SIPS is far from rocket science, but most general contractors are reluctant to employ them. From a purely practical standpoint, it makes good financial sense to spend the extra money initially to build a more efficient building in light of the decreased costs of operating and the rising cost of fuel. Also, there are federal, state and municipal tax deductions available, some substantial. Cabin Creek Timber Frames in Franklin, NC, builds highest quality, hand crafted timber frame buildings which are “green”. Green, in our approach, means quality: sustainability, efficiency, and durability. We design and construct timber frame buildings with structural insulated panels, SIPS, as insulation on walls and roofs. These result in very beautiful buildings-exposed timbers inside, which are very economical structures in heating and cooling efficiency, costing half as much to heat and cool as equally R-rated stickbuilt buildings with fiberglass batt insulation between studs. With SIPS, there is 7% of the airflow through the panel wall compared to that through a stud/fiberglass wall. There is no settling of the foam, unlike fiberglass or blown cellulose, to further degrade the insulating inefficiency. Our frames with SIPS are extremely efficient (green) from the beginning, and are easily fitted with solar, geothermal, graywater, and cistern systems as desired. In Europe, and to a lesser extent in North America, timber frame buildings have been lived in continuously for hundreds of years. Now that we have better insulation, roofing, flashings, etc., there is no reason buildings constructed here cannot last longer. Some contractors have used computer numeric control (CNC) cut frames in the past, and have had trouble with initial fit and dimensions due to accumulation of plus/minus tolerance measurements. Other problems are lack of tight joints, and difficult later placement of sheetrock or paneling, due to wear of the cutting machine, and lack of attention to camber of timbers. Before shipping, our hand cut frames are trial assembled in our shop to insure proper tight fitting joints, accurate dimensions, and ease of overall construction. The frames are locked in proper position before the peg holes are drilled. This means no surprises. They are then taken apart for shipment to the building site. The frame, tongue and groove, and panels are erected in a very short time, usually less than 3 weeks, providing much faster progress to a dry and insulated structure. Rough window and door openings are cut at the SIPS manufacturer’s factory to reduce onsite waste, and are ready to receive the window and door units. Buildings are then turned over to you for completion. The buzzword green, the use of energy, and intelligent building is a subject on which I may tread on many toes. It is important enough to do so. Buildings in the US consume 68% of the electricity generated in the country, and 37% of the energy. If we consider our sources of energy, the political, economic, and environmental consequences of obtaining and using this energy, immediately we realize we need to think and reflect. We do not yet have an unlimited source of energy. The energy needs of our country are increasing. There are drawbacks to most energy sources. The logical approach is to develop and refine each track in the most benign possible way, and to be more efficient in our use of energy. This last phrase needs to be underscored, understood, and undertaken. By becoming more energy saving, or efficient, much energy, political expenditure, money, etc., can be conserved. How do we become more efficient? One building or house built efficiently will not answer this problem, but is a start. Each one built inefficiently is an addition to the overall problem. We already have a number of tools which will cut down considerably on the energy usage in buildings. Unfortunately, most builders, architects, and designers choose to ignore the most important of these. This is the use of efficient insulation. By this I mean the use of insulated panels or SIPS which significantly reduce the airflow through building walls or roofs. The USDOE in studies at Oak Ridge National Laboratory has shown in whole walls (including windows and doors) that equally R-rated SIPS or panel insulation compared with fiberglass batt insulation has only 7% of the airflow through the structure. When thermal transmission in equally R-rated whole walls( with windows and doors) is compared, walls with batt insulation drop from R-17 to R-11, while the SIPS perform as R-17. Interestingly, these studies compared 6″ fiberglass batts with 4″ SIPS. Over a period of years, these differences, along with settling of the fiberglass, consume large amounts of wasted energy, translating into a much more expensive building, and long-term costs to the owner and our country. Users and manufacturers of insulated panels have known for years the efficiency of panels and have documented these monetary savings. Sadly, they are still a well kept secret. Most contractors and architects seem blinded to SIPS or are afraid to approach the learning curve (not difficult) associated with their use.